As a child, I was inspired to use a needle and thread by three generations of my family, whose needlework skills ranged from repairs and dress-making to intricate, hand-stitched embroidery. My own journey began at five years old, with Mum teaching me to stitch a small canvas in tent stitch in our kitchen as she cooked dinner. 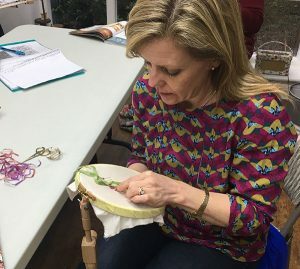 In the 1970s and 80s, through cross-stitch kits and school textile design classes, I eagerly learned every new ‘handicraft’ technique that became available. Over the years, my enthusiasm for needlework has never wavered. Even my gap year was spent in an embroidery shop, cutting out templates, printing the owner’s designs and assisting customers with choosing threads and fabric. Then, after a career in hospitality management, a lifestyle change enabled me to turn a hobby into my vocation. To kickstart my needlework career, I attended various workshops, then attained a City & Guilds Diploma in Creative Embroidery, followed by the RSN Certificate in Technical Hand Embroidery. In 2013, I was accepted onto the ‘Future Tutors’ Programme, by The Royal School of Needlework (RSN), the international centre of excellence for the art of hand embroidery. Since graduating in 2016, I’m now teaching others about the wonderful art a needle and thread can create. As well as teaching day classes and the Certificate and Diploma courses with the RSN, I hold private and bespoke classes in my home studio. I’m also able to travel to anyone who wishes to learn and create their own ‘Eternal Embroidery’. ‘Stories in Stitch’ RSN Exhibition,Hampton Court Palace. ‘Embellishment in Fashion’ RSN Exhibition, Hampton Court Palace.